Last weekend’s soup supper at the American Legion provided patrons with some of the best homemade soups, chilis and desserts that any Central Iowan would be glad to call his own. Among the soup selections, Mike Ball’s cheesy ham and potato soup was surely at the top of the list. So good in fact, the American Legion Riders, who sponsor the monthly dinners at the Legion, couldn’t keep up with demand and Mike’s soup soon disappeared. To be fair, Mike’s culinary skills were not the only ones on display; all of the food was incredible. The apple crisp — a stand out dessert! But what really stood out was the sense of community and the turn-out for the Riders’ meal. And among those who enjoyed the gathering were several veterans from the Iowa Veterans Home. Mike and other members of the Riders made a special effort to serve their fellow veterans a truly home-cooked meal, made with compassion and a great deal of love. These outreach efforts are important because our veterans deserve, at the very least, a chance to connect with the rest of the community — a community, which I hope, demonstrates our appreciation for their sacrifice and service. Next month, you too can show your appreciation. The Riders will host a brunch from 8:30 a.m. to 1 p.m. on Sunday, Feb. 4; and then at 5 p.m. Friday, Feb. 16 — turkey and noodles with mashed potatoes. Free will donations are collected at each meal; proceeds go toward veteran-related activities and programs — many which make a difference in the lives of IVH veterans and others in Marshalltown and Marshall County. Veterans and the work of organizations like the American Legion in Marshalltown is something we all can take pride in. The magazine was our attempt to highlight just a few of the places, organizations, clubs, events, programs and unique aspects that illustrates what makes the community so special. The feedback from readers has been overwhelming and positive; there’s no question that it has sparked dialogue as to what else we might have included in the magazine. As was mentioned in an article that led up to the publication’s distribution, we knew we were limited in how much information we were going to be able share. The 64-page publication featured a listing of 104 things that separates Marshalltown and Marshall County from other locales — but that’s just a small sampling. The good news is that while we were not able to feature everything in this special publication, the hope is that we can continue this effort in future publications and/or continue informing readers in our daily editions of some of the other unique aspects that makes living in this part of Central Iowa so incredible. This not only was an effort to market the things that differentiate us from other communities, it also served as a reminder that we do indeed have some remarkable things to brag about right here in our own backyard. And finally, here’s something to brag about. Like everyone, sometimes we get caught up in the generational differences between ourselves and our children and grandchildren. We remark how things were different “way back when” and “kids these days sure don’t appreciate what they’ve got,” etc., etc. The news of young people getting in trouble or acting entitled rarely escapes the conversation. But a couple of youngsters demonstrated a little bit of gratitude the other day when they left a message of support for some of our local law enforcement officers. Taylor and Logan Hoffman were with their dad, Marshall County Sheriff Steve Hoffman, when he had to make a quick visit to the office last weekend. While he was working on something, Taylor, 13, and Logan, 10, saw an opportunity to do something special. 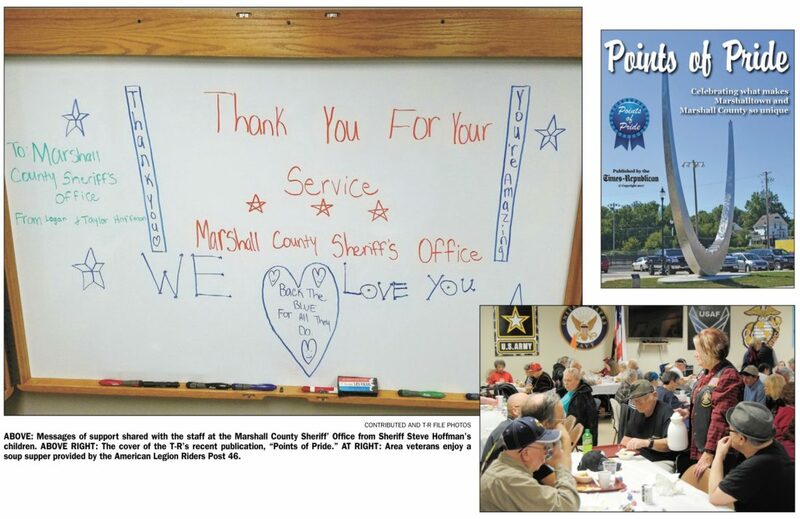 A whiteboard in the sheriff’s office, left blank, provided the kids a chance to say something nice to the men and women who work with their father. They weren’t prompted by their dad; on their own accord, they wrote messages of support. Whether it was the example provided to them by their parents, or just the chance to do something nice with time to spare, Taylor and Logan made the choice to make a difference. We know there’s a lot of things wrong with the world. But that small gesture should remind all of us about what’s right.